Book: Toby Wilkinson's "The Rise And Fall Of Ancient Egypt"
My next read took me to a country I've been hoping to go to for a long time but things have got in the way. The country: Egypt. The book: Toby Wilkinson's "The Rise and Fall of Ancient Egypt ". I checked this ebook from the library to give me background on one of the oldest nation states in the world. I'm not sure what I expected but as I got into this book I realized that the author was trying to do the impossible. Egyptian history, even the subset referred to as Ancient, is huge. This book covers nearly three thousand year. Or maybe I was expecting the impossible. Wilkinson does a pretty good job walking the reader through three thousand years of pharaohs, obsessions with death and the afterlife, and temple building. I wanted more detail but, if he'd included all the detail I desired, the book would have been huge and probably unreadable. There is just too much history. As he wrote it, right when I was getting into a story, the pharaoh would die and the story would end and off you went to the next one in line. Having said all this, the book wasn't a waste. It did help put some things into perceptive. One thing that I found particularly interesting was the interruption of the hereditary pharaohs by, essentially, military coups with Generals and military strong men becoming the pharaoh. It was hard to read this and not think about the last six or seven decades of Egyptian political history with the country ruled by one military strong man after another. And the event of the past three years with the ousting of the Mubarak regime followed by another military take down of the Morsi regime. It sounds awfully similar to events that took place over three thousand years ago. While I was reading this book I also watched an Oscar nominated documentary about the so called Arab Spring events in Egypt. The documentary, "The Square", follows the events from the protests that brought down Mubarak in 2011 to the ouster of Morsi by the Army in 2013. The film follows some of the protesters including a member of the Muslim Brotherhood. It is a fascinating and well done film. The events in the movie sounded so similar to some of the events in the book. Even two thousand years after the fall of Ancient Egypt, things really haven't changed much for Egypt. I hope the events of the last few years are a beginning of change for the Egyptian people and one for the better. I'm not sure I can recommend the book. It wasn't that bad, it just didn't meet my expectations which may have been too high to meet to begin with. That is not the author's fault. "The Square", on the other hand, should be seen by everyone (it is in the theaters and streaming on Netflix). Well, the Winter Olympics are over. I have to admit I didn't watch nearly as much as I'd anticipated. It might have been different if the time zones had been a bit closer. I ended up watching the NBC prime time wrap up each night and I watched very little live. The opening and closing ceremonies are all starting to blur together. If you've seen one large stadium production, you've seen them all really. Before the closing ceremonies even had started ... on delay ... I was moving on to the next thing. That would be the Oscars. On Sunday afternoon I went to the local art house theater and watched the Oscar Nominated Short Live Action and Animated films. This was the fourth time I'd gone to see the Oscar shorts nominees. I always enjoy them. The short format forces the film makers to make careful choices about what is in their film. If the choices are correct the short film can be better than many long films. Movies are usually not at the top of my list of important things but since we started Netflix a few months ago they have recaptured some of my interest. They also fill in some of the time once occupied by the 24 hour news channels. More on that and how it has affected my mood in a later post. I walked with Gv to the airport bus stop less than a block from our hotel. Her bus came at 10:00 AM, we said our goodbyes, and I waved as the bus pulled around the corner. I now was alone and I had eleven hours to kill before my bus left. Once again I had that 'last at the party' feeling. I don't much like that feeling. On the other hand, if I'd left first I would have felt like I was missing out on something. I can't win. 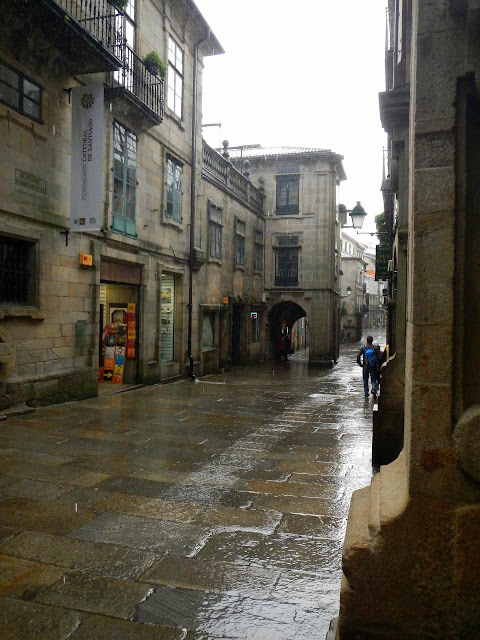 The rainy streets of Santiago de Compostela. I walked to the pilgrim's consignment office, an addition since the last time I was there, and left my bag there. For two euros they would keep you bag for a day. Now, without my bag, I was free to walk around the city. A couple hours later I'd pretty much visited every souvenir shop. I'd looked up and down for a nice Virgin Mary for the Wife and came up empty handed. I did buy a necklace, bracelet, and earring set for the Wife's Christmas present. I gave in and ate at the Burger King for lunch. I did the same thing last time so it may be the start of a ritual ... who knows. I stopped at the internet cafe next door and checked email and news. Nothing much had happened in the seven weeks since I'd last checked the news. It was still messed up. At Gv's suggestion I looked up the email address for Hotel Larry and sent an email about my shell necklace. A famous statue in a nearby park. I wandered around ducking in and out of places as the sun ducked in and out of rain clouds. I ended up sitting in the Cathedral and writing in my notebook several times during my wait. It was the easiest and most comfortable place to be when it was raining outside. It was also fun to watch the pilgrims and the tourists wander around. You could tell the pilgrims by the wonder in their eyes and the silly grins. 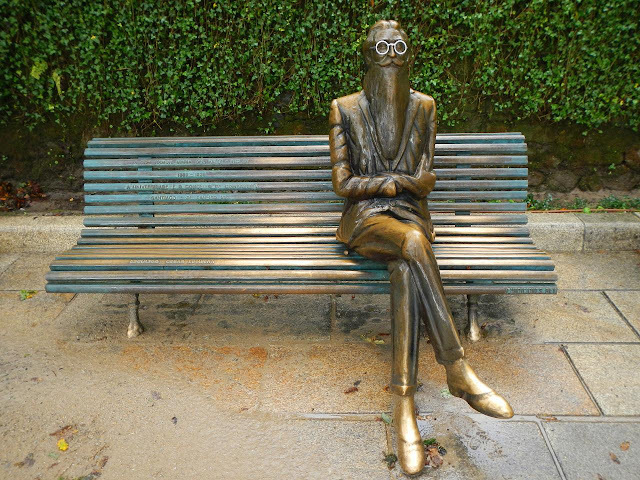 A bench and statue memorializing a favorite professor. I ate my last ice cream - one scoop of chocolate chocolate chip with two scoops of dulce de leche - while I walked in a nearby park. This was my last ice cream ... well, it was the last one in Santiago de Compostela anyway. It was very good. I pointed several pilgrims toward the pilgrim's office. I took pictures for a group of bike pilgrims in front of the Cathedral. I tried my best to kill time. The sun even made an appearance in the afternoon. 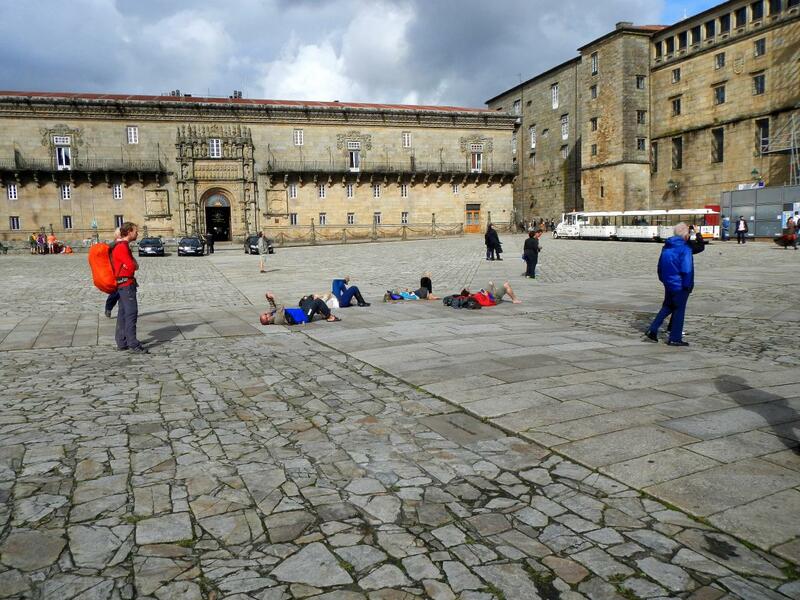 Pilgrims enjoying the sun and the end of their Camino. I'd given up on seeing anyone I knew. 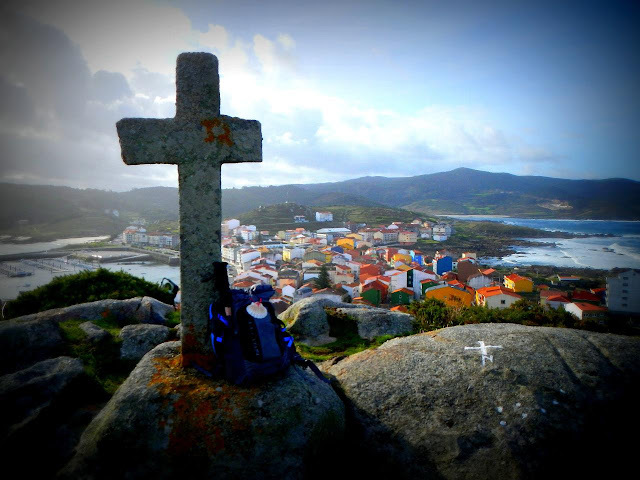 Nr had left to walk to Fisterra that morning and most of the people I'd met were long gone. Then I met the old Brother and Sister (the guy wore the "I'm not her husband" t-shirt). I hadn't seen them in ages - I'm guessing it was over a month. They remembered me and asked about Gv. They'd just arrived and they seemed very happy. I ran into them several times that day as they were touring the Cathedral. I considered taking the Cathedral audio-tour too but never did. When it came time to eat dinner I was totally indecisive. I walked from one restaurant to another checking out menus and nothing ... I mean nothing sounded good. I realized now that when it came time to eat I'd just followed the crowd or, in most cases, Gv. I ended up buying an apple, a banana, and an Aquarius Limon (a lemon sports drink) at a small tienda. The drizzle returned so I went to the consignment office, picked up my pack, and headed to the bus station before it really started to rain. By the time I got there I was sweating and my four dollar umbrella was giving up the ghost. I dumped the umbrella in a trash bin and explored the very uninteresting bus station. Most of the little stands in the station closed their doors at 8:00 PM and they only sold sugary snacks anyway so I avoided them. I'd had enough sugar for the day. I did find a place to buy a sandwich and a coke and that topped off my dinner for the day ... oh and the tube of double stuff Principes in my bag. I confirmed where my bus would be (I'd bought the tickets the night we returned to Santiago de Compostela from Muxía) and I waited. As usual I'd come to the station way too early. I kept my eyes open for other pilgrims but I didn't see any. I guess most pilgrims either fly home or take the train. I was taking the bus more for time reasons than anything. The train got to Madrid too late for me to catch my flight. The bus would drop me off at the airport with time to spare. The bus left on time. There was only one more pilgrim on the bus - a bike pilgrim - who spent most of his time talking on his cell phone. I tried to sleep but it didn't come easy. 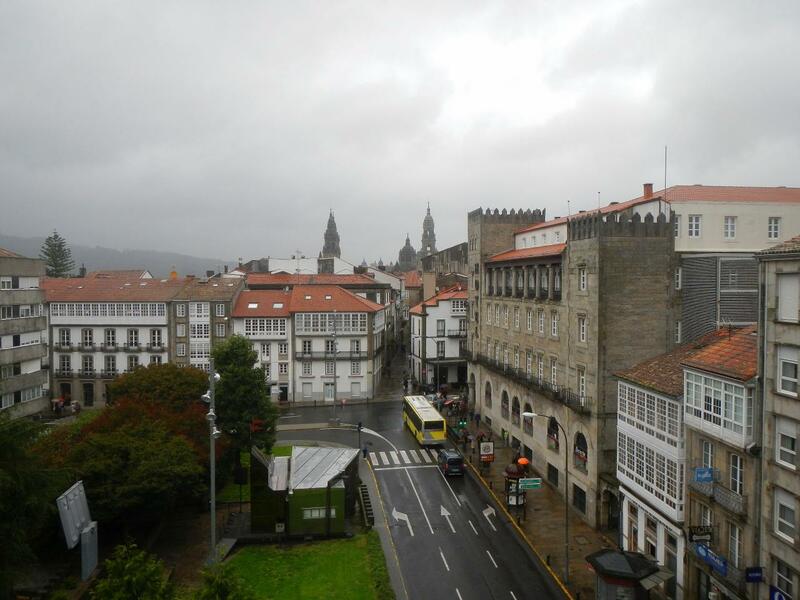 The bus passed through A Coruña, Lugo, and Ponferrada, on the way to Madrid. It was funny to see Camino markers as we passed Pereje and approached Ponferrada - especially since I was going the opposite direction as I'd walked it. It was too early in the morning for pilgrims to be walking when we passed through. I arrived in Madrid, changed buses and got to the airport five minutes early. I was so early I had to wait an hour or so before I could check into my flight. I gave my pack to the airline clerk and hoped it would get home in one piece (it did). Going through the first security checkpoint was easy. There was a second checkpoint at the gate - thank you America for your strict security rules. I stop at a cafe and bought my last natural orange juice and chocolate napoleon for breakfast. I topped it off with an ice cream bar ... yes, ice cream for breakfast. I tried my best to get rid of my euro coins but didn't quite succeed. They opened the second security checkpoint and I went through. I was picked for a secondary screening. They asked me questions about what I was doing, gave me a basic pat down, and x-rayed everything I had and searched my carry on. Nothing major. I bought an Economist magazine to read on the flight to Chicago, I ate everything they offered on the flight, and did my best to stay awake so that I would be in sync when I got home. I even watched the in flight movie, something I rarely do. In Chicago you have to go through immigration. What a freaking mess!!! I ended up standing in four different, long, slow, and unorganized lines. Fortunately I had plenty of time to work my way through the security/immigration swamp. I ate at McDonalds and finished the meal off with some Ben and Jerry's. The flight home lifted off just as the sun was going down. The view out the window was spectacular. Once again the sun was pointing the way. 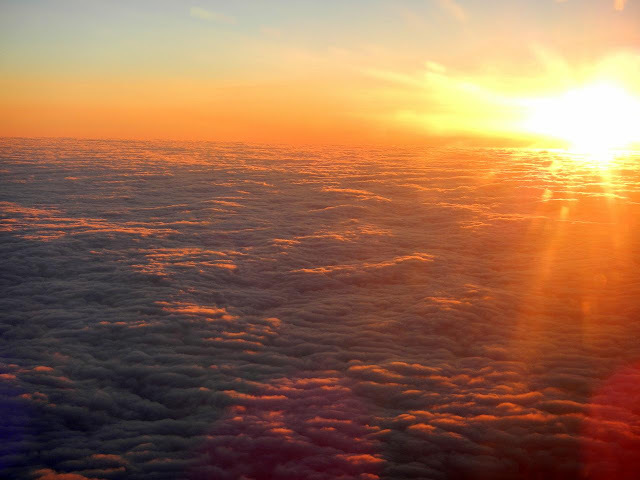 From my airplane, the sun going down outside of Chicago. The Wife picked me up at the airport. I think I was a little more mellow about the whole experience this time. I will post more about how I felt in a future post but for now I can say that, while I enjoyed my Camino, I was happy for it to be over and for me to be home. Pictures can be found in my 2013 Camino de Santiago Google Photos album. I slept in really late this morning. It was over. Really over. 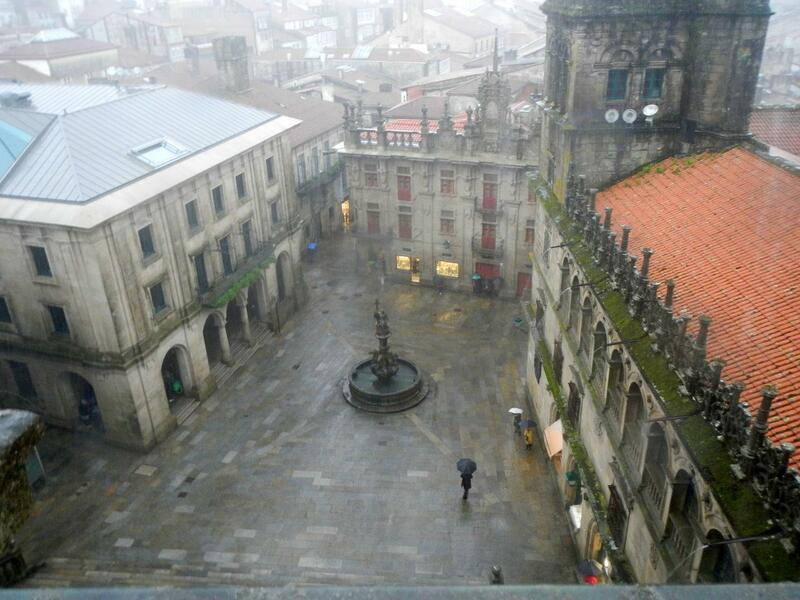 I still had almost three days in Santiago de Compostela but it really felt like the end for me. View from my hotel room balcony - the Cathedral towers can be seen. When we left the hotel it was drizzling. It was too late to go to Pilgrim's mass ... yes, I slept that late ... but we went to the Cathedral anyway. We'd heard from KSam about a Cathedral roof tour that sounded very interesting so we went to the visitor's center and asked about it. There was a tour that afternoon at 5:00 pm. We thought about it a bit. Would the rain stop by then? Would the weather be better the next day? We decided to heck with it and we signed up for the one that afternoon. We wandered around the city the rest of the afternoon doing some sight seeing, souvenir shopping, ice cream and chocolate truffle eating, and dodging in and out of the rain. Sometime along the way we ran into Rh and Nc. They were on their way to catch a bus to the airport. They were tired of the rain and were heading for Portugal in search of some sun and sand. They were such nice people. We hugged our goodbyes. 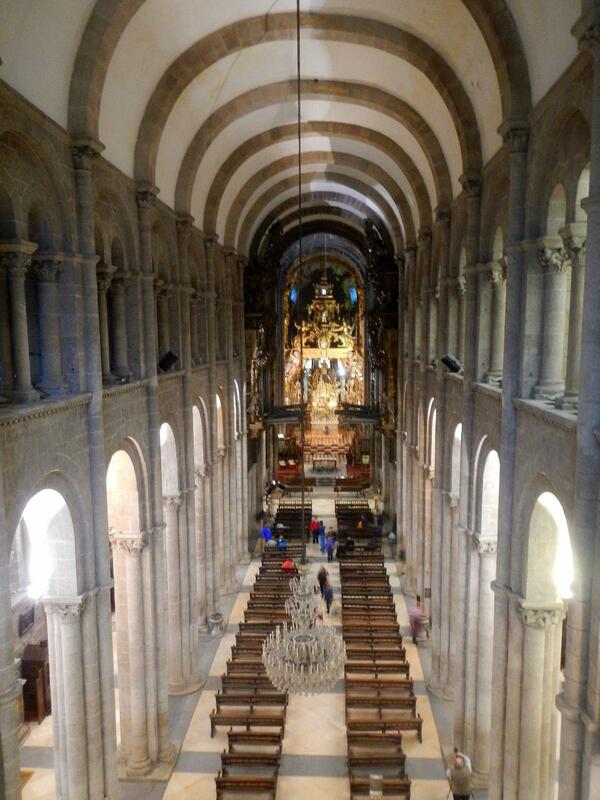 The inside of the Santiago de Compostela Cathedral. That afternoon we stopped and bought a pair of umbrellas and headed to the Cathedral. Our hopes for a dry tour were dashed as the drizzle turned to rain. We sat in the lobby of the visitor's center waiting for the tour to start when I looked up and saw Nr. We hadn't expected to see each other until the next day - that had been the agreement that we'd made way back in Torres del Rio. We were all excited to see each other. Nr joined us on the tour. The guide showed up and, after a brief movie we were taken up into an area overlooking the inside of the Cathedral. She explained the long history of the Cathedral. We then went up one of the Cathedral towers. There are three tall towers and two smaller towers. The tall towers are the clock tower, the bell tower, and the carraca (rattle) tower. The carraca is similar to the new years noise makers. There are four boards arranged in an X. 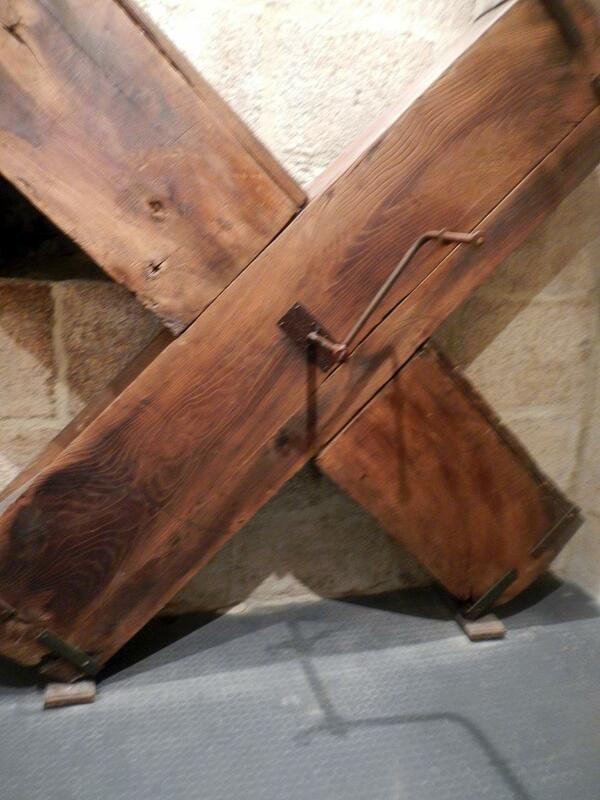 In the center of the X where the board meet is a toothed wheel. As you turn the wheel the boards flex over the teeth like a ratchet and make a loud rattle noise. The carraca is used to call people to prayer on days that are considered too somber for the peel of bells. The Cathedral clock tower - one of three tall towers. After visiting the carraca we went out on the roof ... in the wind .. in the pouring rain. The umbrellas helped but not much. We walked around the perimeter of the roof. Normally we would have gone over the top of the roof to the other side and enter by the other tower but, because of the rain, our guide took us back in the same tower we's exited and took us to the other tower on the inside before going back outside. It was kind of amazing that nothing was slippery up there despite being wet. The guide explained that the roof had been made to be safe in all weather so that soldiers could defend the Cathedral from attacks. The south entrance to the Cathedral. The pilgrim's office is just around the corner by the blue umbrella. We went back in and, since it had been so rainy, the guide took us to a famous Cathedral entrance normally not on the tour. 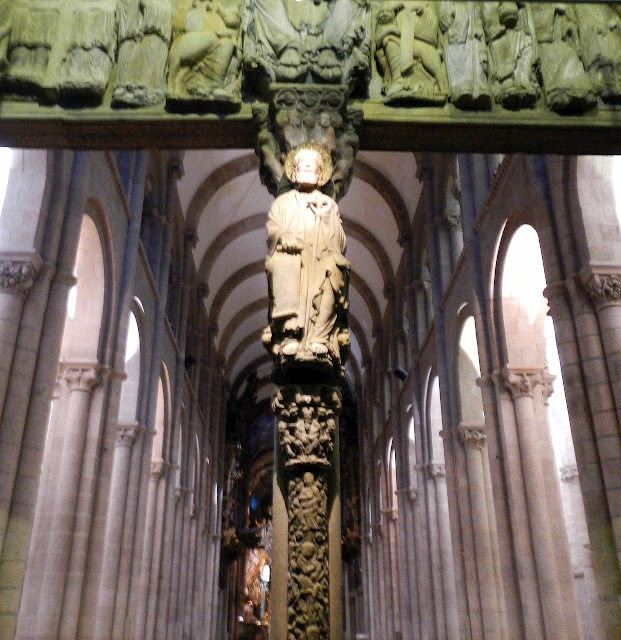 The Pórtico da Gloria, currently being restored, contains a central pillar with a carving of Saint James. The tradition is for pilgrims to hug and kiss the statue as they enter the Cathedral. It is currently off limits because of the damage caused by the acids and oils in pilgrim's perspiration. This unexpected addition to the tour was a nice surprise. Sculpture of Saint James at the west entrance of the Cathedral. We exited the Cathedral through the museum with it's collection of Saint James statues, figurines, and holy texts. The tour was definitely worth it even with all the rain ... though my picture taking outside was a bit limited. After the tour we followed Nr to a bar where we met members of her Camino del Norte family. We exchanged stories, reminiscences, and laughter. We moved from the bar to a tapas restaurant. The table ordered a variety of tapas and we all shared. The food was delicious and I had some of the best cooked beef I'd ever had in Spain - I just wished I'd ordered more of those. I had my first taste of calamari here - seemed a little bland to me but not bad. The stories, reminiscences, and laughter continued as we ate. 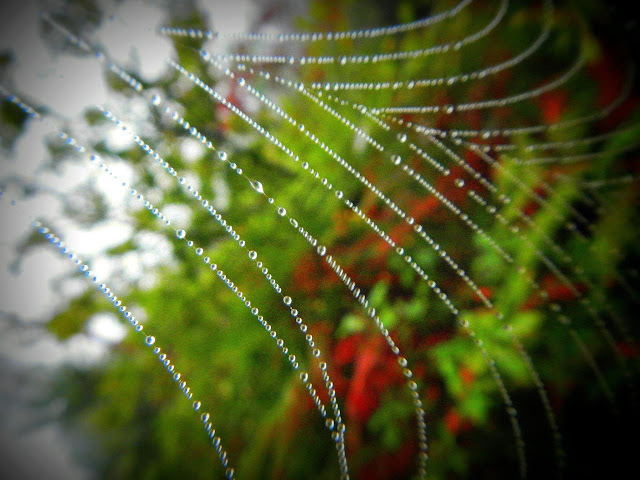 Outside the rain continued to come down but I found that good company trumps all ... including demoralizing rain. That night I didn't sleep well. 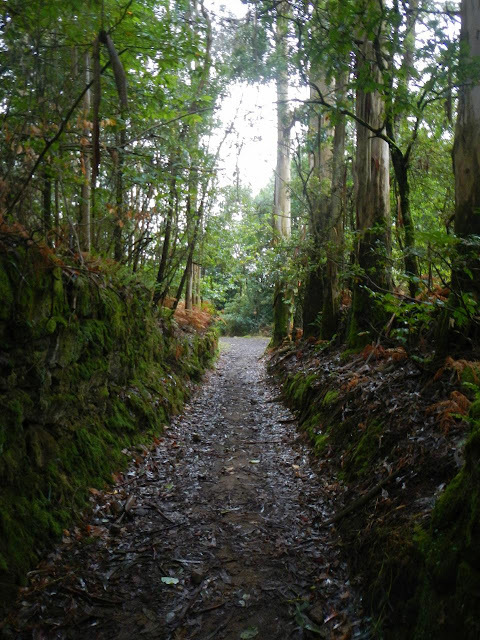 I laid in bed thinking about what I'd heard about the Camino del Norte and the Camino Primitivo. I thought about options taken and not taken. I thought about the feelings that arise when you see your Camino friends go. The thoughts swirled around until I finally, slowly, drifted off to sleep. On day 46 I managed to get up in time to go to Pilgrim's mass at the Cathedral. We got there early and I wandered around like I did last time. In the gift shop I ran into Kt, the Omaha pilgrim, who I hadn't seen since Cirauqui. She was happy to be done and had done well. I went back to my pew and waited for the mass to start. Mc, who we'd met a while back, was sitting in front of us. The mass was similar to what I'd experienced last time. 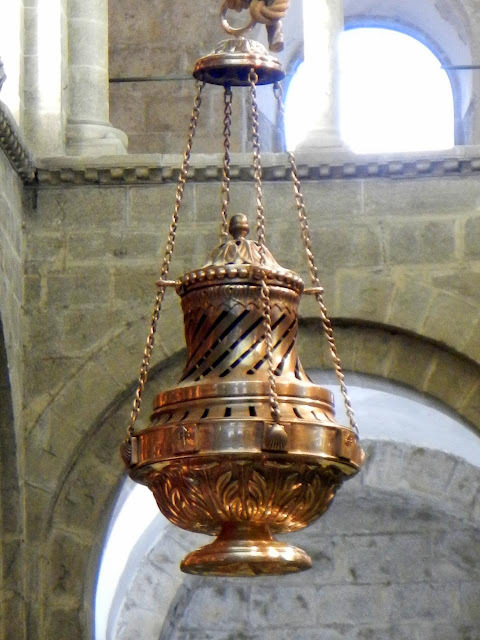 I was lucky again as the Botafumeiro was going to swing during mass. A member of a pilgrim's group sponsored by Banco Santander got up and gave a strange speech that was a mix of how great the Camino had been and how great their bank was to sponsor them. It sounded like a commercial. In my head I heard "The swinging of the Botafumeiro is sponsored by Banco Santander, your friendly neighborhood bank." Click here to see a video of the Botafumeiro swinging. As the mass was coming to an end they started to swing the Botafumeiro. Last time everyone had stood up with their cameras. This time people who tried were chastised almost immediately. I was sitting on the end of the pew so I could hold my camera out to the side and video the botafumeiro without suffering the wrath or blocking anyone's view. Unfortunately I stopped videoing about thirty seconds too soon and missed the attendant grabbing the botafumeiro and doing a graceful pirouette to slow it to a stop. After Mass we met with Nr and and went out to lunch. We still had a lot to talk about. Eventually we parted ways. 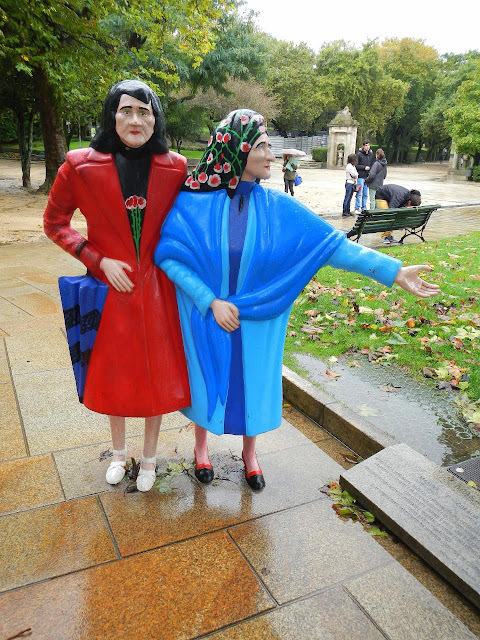 Nr wanted to meet with some of her Camino del Norte family. She would be starting the walk to Fisterra the next day. I don't really remember much of that last afternoon. I think I bought some more chocolate and I know I ate more ice cream - that's a given. I don't remember where we ate or what we ate. It probably was good but I have little recollection of the meal. I think I was starting to shut down. I would start my journey home the next day and I was ready to go. I packed my backpack for one last time that night. I managed to get most of my hiking poles into my pack, secured the straps around the back of the pack and put on the rain cover on. Made a nice, compact package suitable for checked luggage. All packed up I went to bed for the last time on the Camino. Want To Hear A Sad Story? A few days ago I noticed that someone on Flickr with the username accpublishing1 was favoriting some of my Omaha pictures. With the word publishing in the name I was wondering when they would ask to use one of my pictures. I didn't have to wait long. I got a nice message from a representative of American City Calendars. She wanted to use one or more of my Omaha/Henry Doorly Zoo pictures. When I read this I got really excited. They may use one of my pictures in a calendar which could mean lots of eyeballs looking at one of my pictures. I got even more excited when she said I would be "compensated" for their use. While this may be a little shallow and materialistic, money is often exciting to me. I read on and then ... my bubble of excitement deflated like a noisy balloon (you know that noisy, funny, flapping, farting noise). The next line, the one after the mention of compensation, stated they needed pictures of at least 4000 x 2000 pixels. The only size I had was 1280 x 960 - way too small for their needs. The original pictures they were interested in were destroyed in the hard disk crash of October 2012. It's been over a year and that crash is still costing me money. That's my sad story. Boo Hoo. The night before, after we walked back to the albergue in the dark, getting there just when the drizzle started, Gv and I discussed walking to Muxía the next day and we both decided we were done walking. We would take a taxi this morning instead and then a bus from Muxía back to Santiago de Compostela tonight. My only regret was that I wouldn't break the one thousand kilometer mark, stopping instead at 991 kilometers (615.78 miles). I suppose if you included all the walking in the towns and cities and the walk to and from the lighthouse, we probably passed the one thousand kilometer mark a ways back. No regrets then. We gathered our stuff and crossed the street to a cafe and had breakfast. We watched the pilgrims gather to catch the bus back to Santiago de Compostela. We talked with the Korean couple who were heading back this morning. She was feeling a bit under the weather and was glad to be done. We sat with Kr, the Austrian lady we met ... felt like years ago, and told her we were going to Muxía. She said she would like to go to and we decided to share a taxi. After the bus came and went with a load of pilgrims, we found a taxi and we went to Muxía. It felt odd to travel so fast. The rocky shore near the church. The taxi dumped us off in downtown Muxía not far from where the bus stops. We grabbed our bags and walked along the road out to the main attraction of Muxía: the Santuario da Virxe da Barca. It is said that after Saint James was executed, the Virgin Mary took his body in a stone boat and brought him to what is now Spain. The church is located where the stone boat supposedly landed. 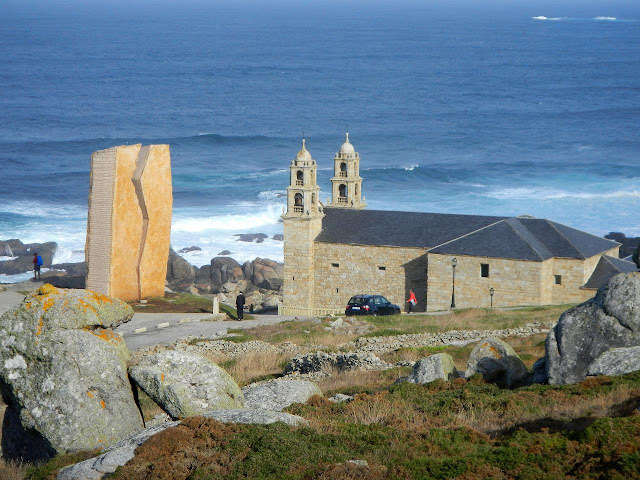 The church near the rocky shore and the monument to the oil spill. The church is located on the rocky shore. The front faces out over the ocean. The church was closed but you could still see inside. Models of boats and ships hung from the ceiling. Mass was held there later in the day but we heard about it after the fact. The coast is rocky and dotted with huge boulders. Some pagan religions have assigned special powers to some of the rock like bringing love or curing arthritis. The mix of pagan and christian was interesting. I hopped around the rocks for a while ... until I almost fell flat on my face. I smacked my arm pretty hard but I didn't drop my camera. Fortunately no permanent harm was done to me or the rock. The monument to the November 2002 oil spill and a Camino marker. 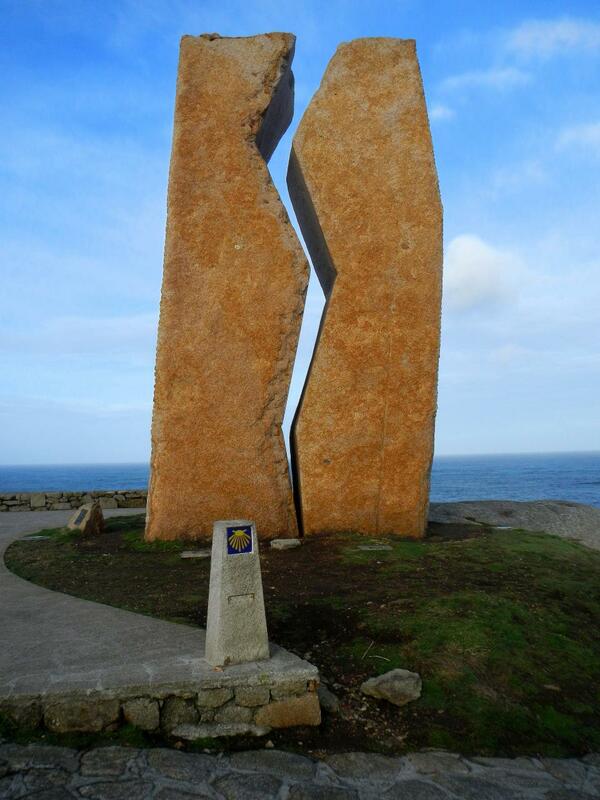 Beside the church is a large stone monument - a monolith with a large crack running vertically. The monument memorializes a large oil spill that took place here November 2002 - the third largest in history. This part of the coast that includes Muxía and Fisterra is called Costa da Morte (Coast of Death) because of all the shipwrecks off the coast. The oil tanker was one more victim of the coast. The cross at the top of the hill overlooking Muxía. That's my pack. A path lead away from the church up a short hill. From the hill you got a 360° view of Muxía, the church, and the ocean beyond. It was a beautiful place. We took pictures of ourselves at a cross at the top of the hill (my picture is on Facebook for friends and family). We returned to the town and looked around. Not much was open on Sunday. I was in dire need of finding a statue of the Virgin Mary for the Wife. 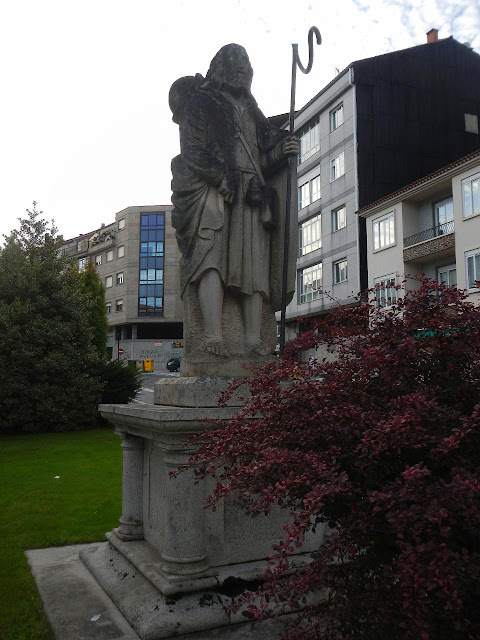 All along the Camino all I found were statues of Saint James. I figured Muxía, with it's Virgin-centric legend, would be my better bet. I had very little luck. I did find the one souvenir shop in town and it did have Marys but they seemed cheaply made. In the end, after walking around some more, I returned to the little shop and bought the Mary and a couple magnets. The bus didn't leave until after 4:00 pm and we ended up having hours to kill. We walked around the town and found very little open and what was open was very commercial and not pilgrim or even tourist centric. We ended up basically going from bar to restaurant to cafe. We walked outside when it was clear and went inside when it started to showered which it did on and off all afternoon. We talked to some pilgrims who had walked from Fisterra. Apparently we hadn't missed too much. I was bored. I was so bored. And tired. I was so tired. 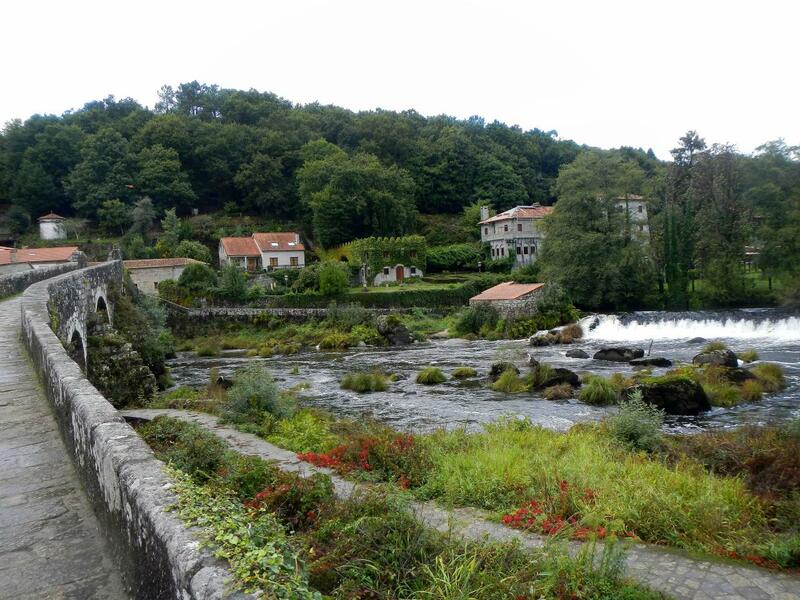 Muxía was a nice place to visit and it was picturesque but the visit should be a short one. Perhaps in the summer there was more to do. I had my last hot chocolate and realized, after four hot chocolates, that I really didn't like it very much. I was very happy when the bus finally arrived. The bus ride was longer than I expected. 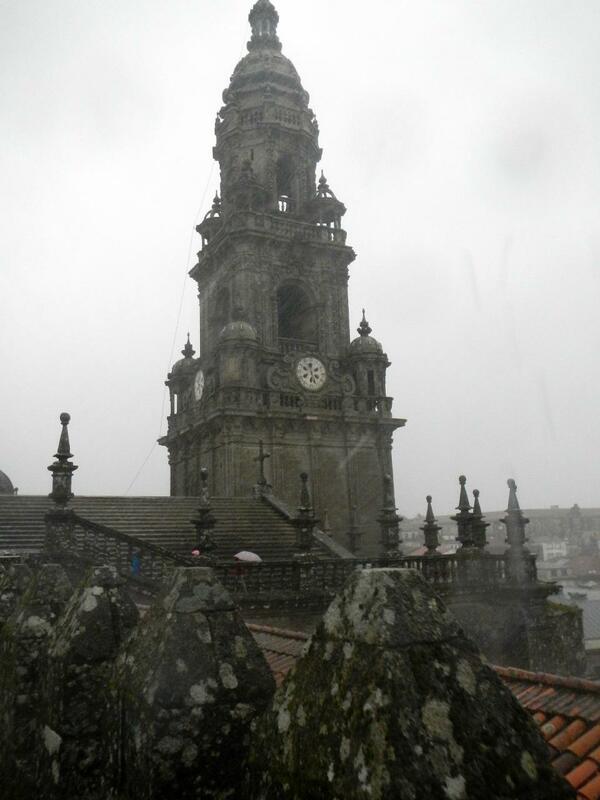 It stopped a few times before arriving in Santiago de Compostela. By the time we got there it was dark and raining. We left the bus station and walked in the rain to where we thought out hotel was. Gv had made reservations for us. We found the hotel, went in and ... they didn't have our reservations. We checked under different names and spellings ... nothing. Finally we asked to use a computer to see the confirmation email. He wouldn't let us use their computer but pointed us to an internet place nearby. It turned out to be the same place I'd gone to use the internet last Camino. Gv checked her email and ... we'd been at the wrong hotel. This was an honest mistake since we looked at two different hotels before she made reservations. We both just forgot which hotel we'd chosen. The day had felt a little tacked on after the feeling of completion I felt in Fisterra. I'm glad I went to Muxía. The church and the view of the coast were worth it. It might have been different if we'd walked. We wouldn't have had so much extra time. Maybe if we'd walked to Muxía first and then walked to Fisterra it would have flowed better. I don't know. There is no map this post since we didn't walk from anywhere. I woke up and went to the front desk to pick up our clothes. The manager took me up to the furnace room where clothes lines were strung around in all directions. I walked along the lines pulling off my and Gv's clothes which were randomly interspersed with other peoples stuff. I'm surprised that I didn't miss something. I packed my bag, checked out of the hotel and joined Gv on the way out of town. The weather was quite a bit different from the day before. It was quite pleasant. Corcubión harbor in the early morning. 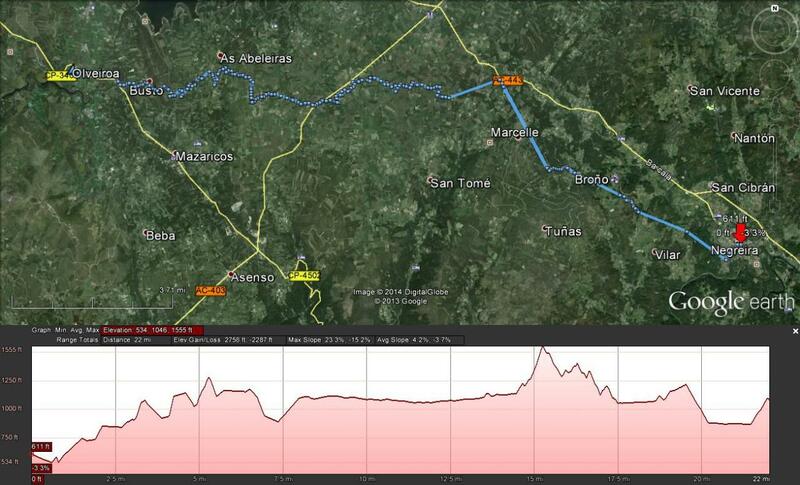 We walked to the next town, Corcubión only a kilometer or two away. This is where I got lost last time and took a wrong turn. This time there was more light and we managed to take the correct turn. The Camino isn't marked well in this small town. At one little square I stopped and looked around trying to find an arrow or something pointing the way. All of a sudden I heard someone saying something and, looking up, I saw a hand pointing out of a window. The town may not be well marked but it does have helpful people. The rest of the walk was gorgeous. There was a slight wind but the sun was out and there were only a few white clouds in the sky. We hadn't seen the weather forecast so this came as a surprise - one I welcomed wholeheartedly. What a difference from the day before. 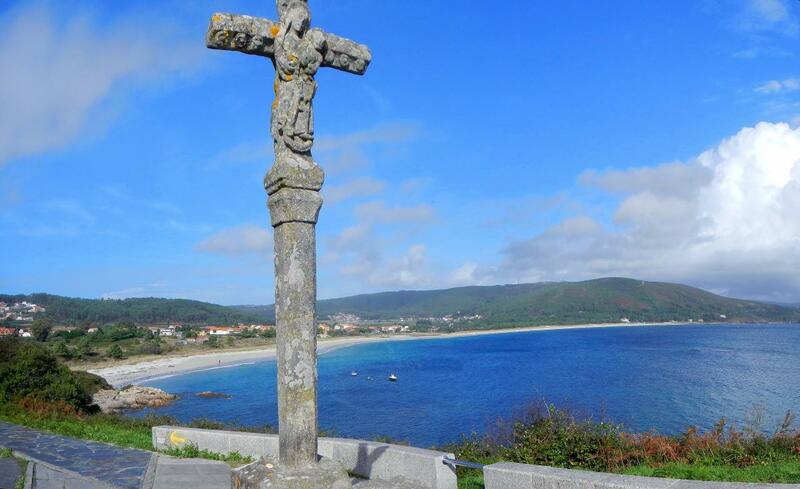 Just before you reach Fisterra you top a little hill called the mirador or lookout. From there you can see all of Cape Fisterra. The view from there today was incredible. 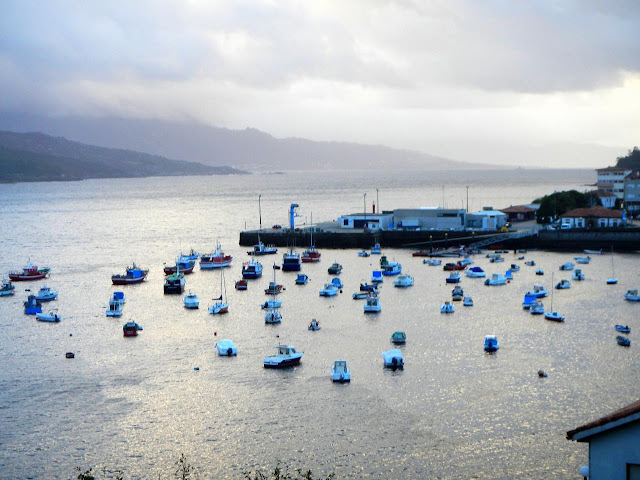 View of Fisterra from the mirador. As you reach Langosteira beach you have a couple choices. You can follow the path and walk on a boardwalk/sidewalk that parallels the beach or you can walk on the beach. Last time I did the boardwalk/sidewalk. This time I took the beach and it was the better of the two choices. Walking on the beach was easier than I expected and the sound of the surf was incredible. I think I was humming most of the way. Last time I walked Langosteira beach there had been thousands of shells. The beach had changed a lot. There were few shells this time. I was a bit disappointed. All of a sudden I put my hand to my throat and realized I wasn't wearing the shell necklace. I did a quick mental inventory and realized I hadn't seen it today. I hadn't packed it. The last I saw of it was the day before on a table in my hotel room. I must have forgotten in at Hotel Larry. Me and shells ... How could I have been so careless? *sigh* Not only had I lost my shell but I'd lost the monk blessed Bhutanese cord I'd put it on. Bummed me out the rest of the walk along the beach. We reached the municipal albergue and it wasn't open yet so we walked around to find something to eat. We found several restaurants with great looking menus but they would not be serving until 1:00 PM - the same time the albergue would open. We finally found a small bar that served food and we ordered some sandwiches for lunch. We checked into the albergue when it opened and we went out to explore the town and the beach. We ran into Vn. He'd walked to Fisterra the day before in the rain. He looked very happy. We went for a walk on the beach. I picked up a few shells. I was a bit disappointed by how few shells there were this time. I'd told everyone about all the shells and now they would think I was nuts or something. 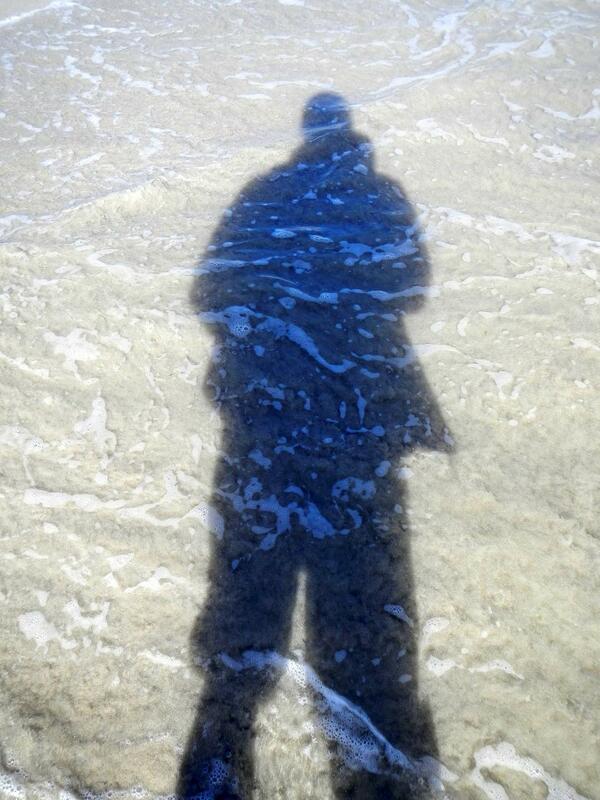 My shadow under the sea. I let the water wash over my feet. When the water receded I noticed that the bandage on one of my toes that had been holding onto the nail was not there anymore. Neither was the nail. My contribution to the end of the world. 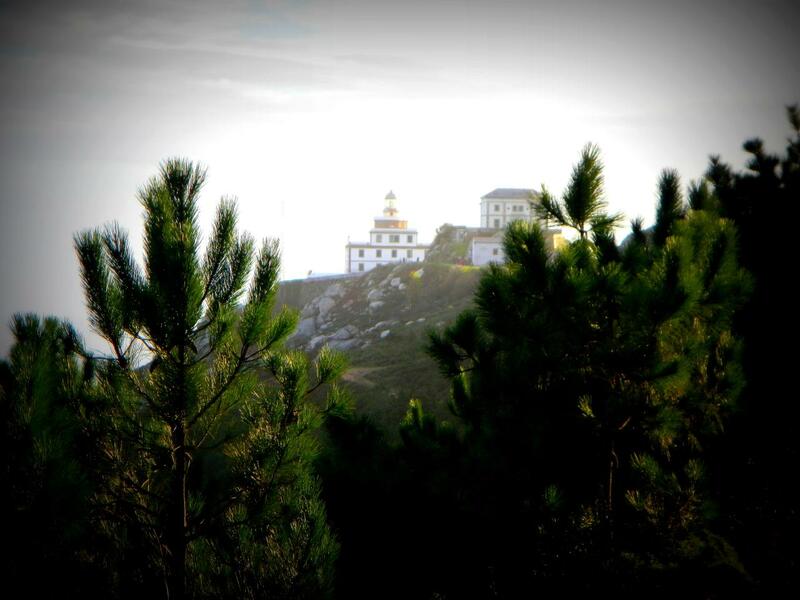 Faro Fisterra through the trees. Late in the afternoon we picked up supplies for a picnic meal and walked out to Faro Fisterra, the lighthouse at the end of the world. When we got there people were starting to gather. We got stamps at the lighthouse and then walked out to the end of the cape just beyond the lighthouse and found some rocks to sit on. It was windy and a little chilly but you could see the sun near the horizon so it didn't matter. 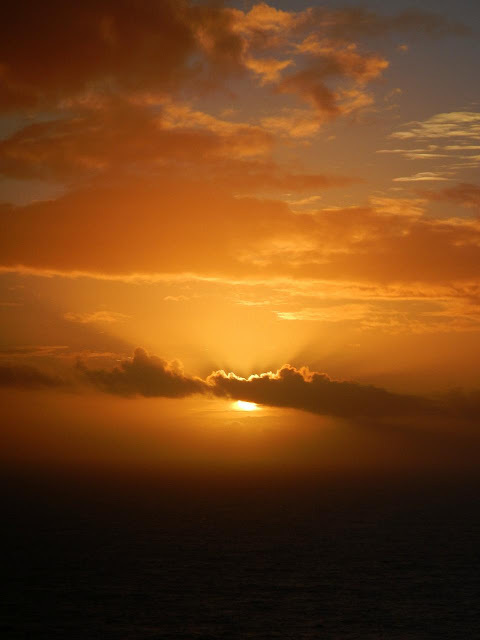 As I sat there eating my sandwich and chocolate, watching the sun slowly set over the Atlantic ocean, I felt a deep feeling of satisfaction. 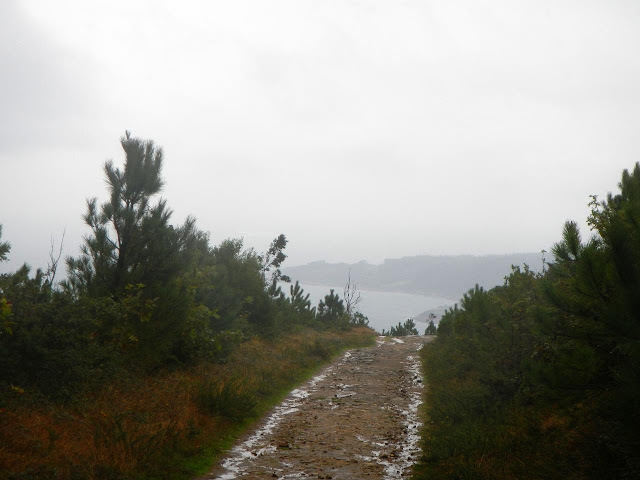 I'd had a feeling of things being incomplete last Camino. This time, as I watched the sun go down, I felt everything was complete. The feeling I'd hope to feel last time was there. My Camino was finally and truly over. The sun setting at the end of the world. As I watched the sun lower into the Atlantic, I wondered what the pilgrims of a thousand years ago had felt seeing this. When the pilgrims of old watched the sunset, it was pointing to the end of their world. To me the sunset was marking the end of my Camino and pointing the way home. I took some nice pictures today so please check them out. 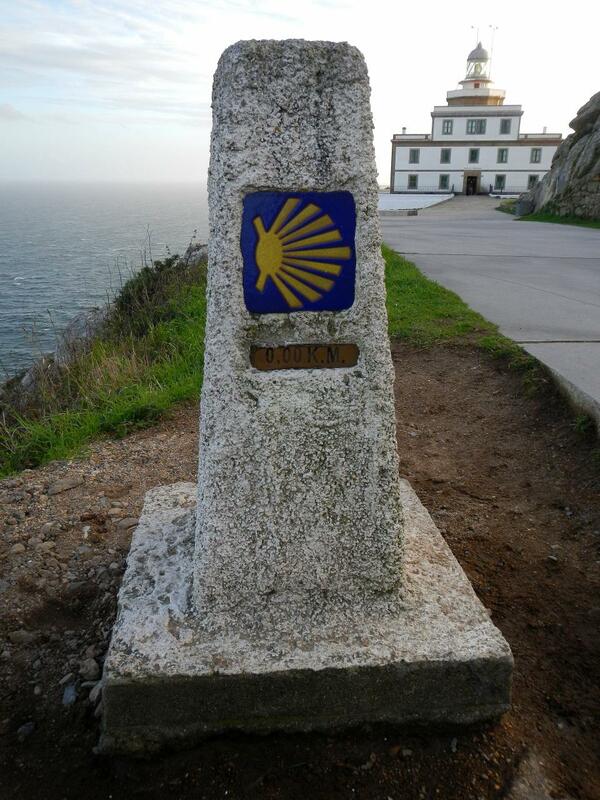 Pictures can be found in my 2013 Camino de Santiago Google Photos album. Approximate Track of the day's hike. I'd gone to sleep hoping for cooperative weather and woke up to some nasty wind driven drizzle. 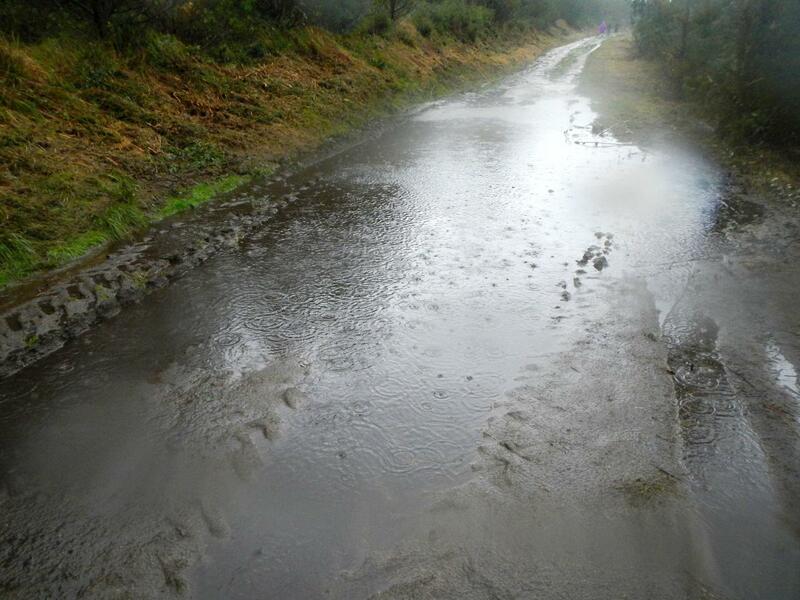 Despite this we left the albergue fairly early and headed on our way to Fisterra. We'd shared our room in the albergue with some biking pilgrims. They passed us just outside of town and, for once, I did not envy the bikers. The wind must have been brutal for them this morning. The river down below us not obscured by fog this time. While the skies were overcast and the the drizzle was fairly constant I could still see better than the last time I walked through here. Last time the fog obscured the river running through the valley below the trail. The Camino reached it's peak of the day near the town of Hospital (I wonder how many towns in Spain are named Hospital - the Camino passes through several). They are building a Pilgrim's office in Hospital but it wasn't complete yet when we passed through. We did stop at the cafe. The cafe is the last place to get food and drink on the way to Cee which is some 15 km (9.3 miles) away. The lady who ran the cafe was awesome. She was nice and had a smile on her face. She made us feel welcome. We ordered food (croissants, bananas, and a slice of biscocho for me) and some orange juice. Vn was here (he'd left before us) and we chatted a bit. As we ate the drizzle became rain and the rain became a downpour. 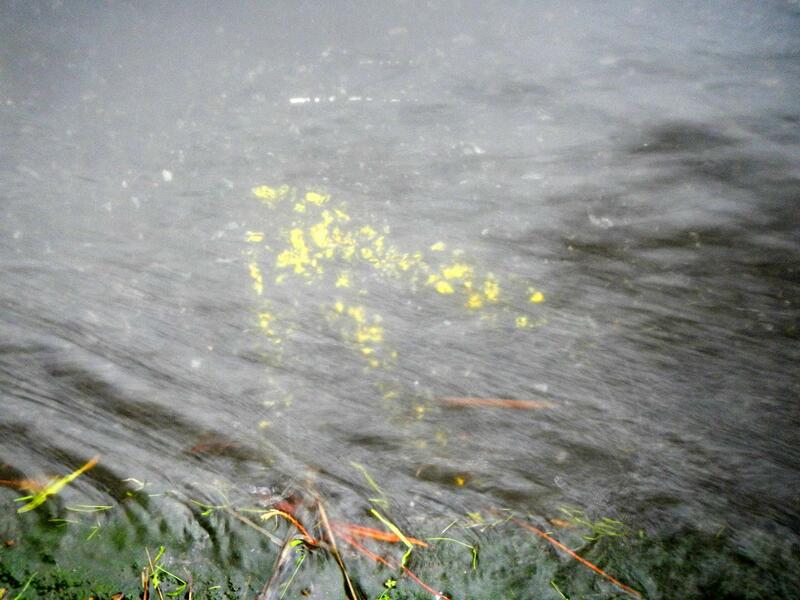 A Camino arrow under an inch of running rain water. We headed out into the rain hoping it would die down but it didn't. The wind we'd fought all morning continued to blow. I was soaked to the skin before we even left Hospital. As the Camino weaved it's way along fields and hills, we turned a different side towards the wind blown rain. I felt rain in my face, rain from the right, rain from the left, and even rain at my back. I was thoroughly drenched. I was carefully walking around huge mud puddles when I thought to myself "What's the point?" Why was I walking around the puddles? I was already soaked and my shoes were completely full of water and squished each time I took a step. What was the point in walking around them? I still found myself walking around the puddles though - I couldn't help it. A small puddle to walk around. 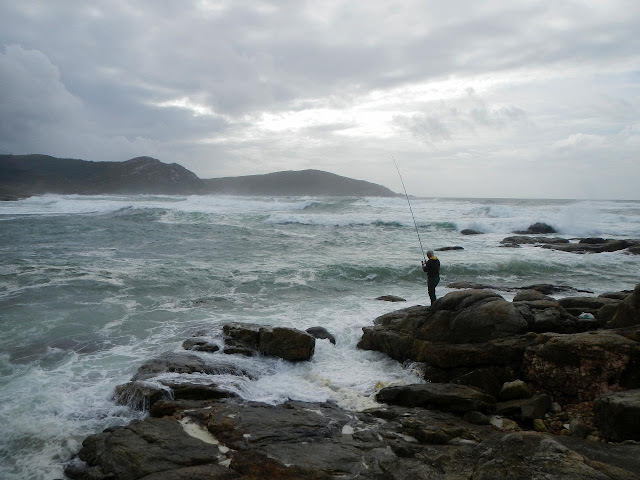 A few kilometers outside of Cee we decided that we would not be continuing on to Fisterra that day. I think it was Gv who said it out loud first but we were both thinking it for several kilometers already. The rain and wind were just so demoralizing. We reached the last hill before you dropped down into Cee. This is where you see the ocean for the first time. Sadly, with the rain the ocean was not visible. it did come into view as we approached Cee. We reached Cee and stopped at an albergue. It wasn't open yet so we waiting under the awning out of the rain and waited ... and waited. The opening time came and went and I grew impatient. Not far up the street was a hotel. 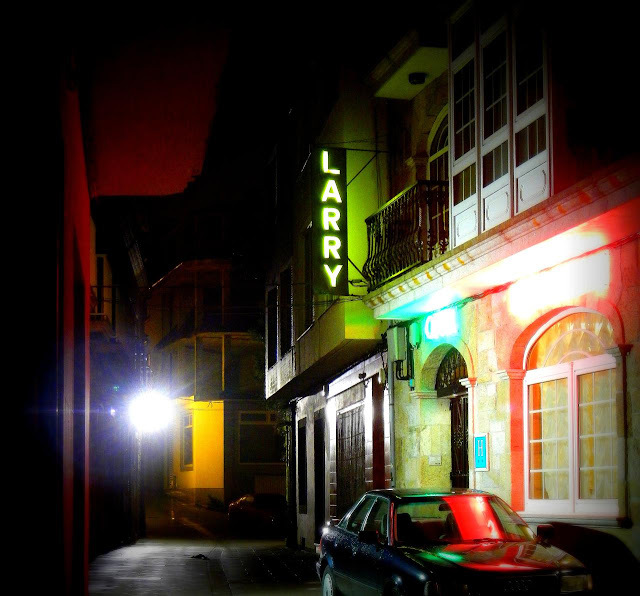 Hotel Larry. Yes, the hotel was named Hotel Larry. We walked back to the hotel and got rooms. We asked about laundry and the guy running the hotel said they had laundry services and they were included with the room - no extra charge. Wow. That was a first. We went up to our rooms and changed into something dry. All I have to say is thank you to the guy who invented the dry sack. I had a large dry sack in my pack where I put all my clothes in. They stayed nice and dry. 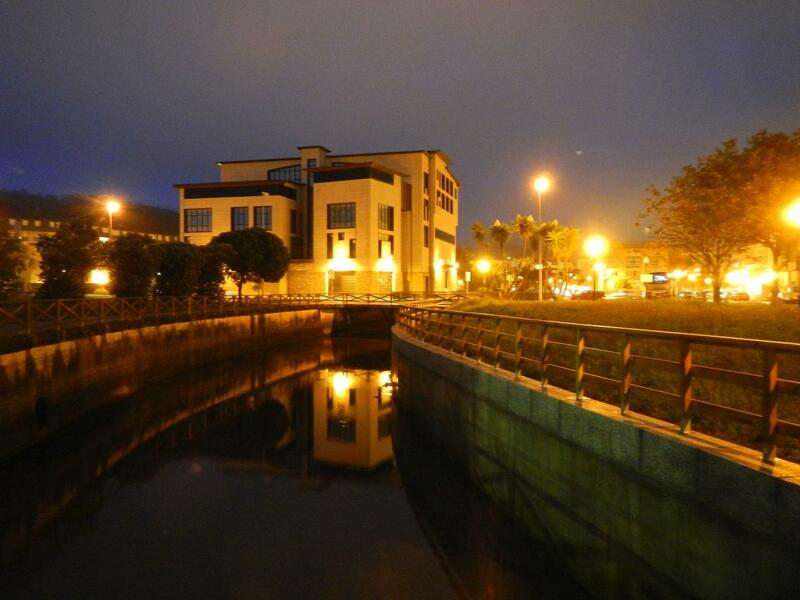 The night lights of Cee. By late afternoon the rain started to diminish and became a light drizzle. It slowed down enough for us to go walk around Cee. We saw the ocean through a thin haze. We ate some lunch, found an internet cafe and sent out emails, and stopped at a grocery store for supplies. Back to the rooms for naps and then we went back out for dinner. By early evening the rain had finally stopped altogether and the city streets, which had been empty in the afternoon, filled up with people going out to eat, shop, and enjoy the evening. Our home for the night - Hotel Larry. This day had been a truly miserable walking day even though it did seem to go by fast. The albergue did finally open but I think I was happier in my real bed with a real bathroom with a real shower and real towels at the Hotel Larry. After three non-fiction books I decided it was time to go back to fiction. I looked at what was available at my library in ebook form and checked out Ramz Naam's "Nexus ". The book is set in the year 2040. Biotech and nano technology has advanced to the point that people are enhancing their bodies and creating new drugs for recreational purposes as well and for more nefarious uses. After a bioterrorist incident in the 2030s, new laws are passed in the United States and global regulations are set up to prevent the misuse of the new technologies. Just like technologies can be misused, the regulations and laws created also become abusive and authoritarian. One example is that people who modify themselves genetically to become trans-human or post-human are no longer considered human and therefore have no human rights. They can be incarcerated without cause and terminated without due process. The protagonists of the book is a scientist who has found a way to build an operating system (OS) on top of a nano drug called Nexus. Nexus, when ingested by two or more people, allow these people to share thoughts and emotions. The OS allows you to control your brain just like you control your computer. The other main character is an agent of a part of Homeland Security in charge of seeking out and destroying advanced bio/nano enhancements. The book also has groups wanting to exploit Nexus to create assassins and to control people and people who what to replace the human race with technologically enhanced post-humans. Through all these different characters and groups, you are shown all sides of the argument. Should these technologies be stopped? Should they be set free? Can they be stopped if you wanted to? Is the march of technology stoppable? Will the positives out way the negatives? When do we stop being human? Many questions are raised by this book. There really aren't any clear cut answers. The book does take you in one direction which I think would be the most likely one. I won't spoil the story. As for Naam's writing style. Many of the characters feel rather cliche. I have read similar stories with similar characters before. Even the ending, an ending that is very opened ended, was predictable. Having said this I did enjoy the book. It raised questions that made me think. Making me think is often a good thing. There is a sequel ("Crux "). I will have to look it up sometime to see what answers, if any, Naam has come up with. Recommended for light reading. One more note. After reading so much non-fiction lately, I felt a little guilty about reading fiction. It was like I was reading empty calories. Am I wrong to think that non-fiction is more 'nutritious' than fiction? We got a late start this morning, leaving the albergue at around 9:00 AM, and walked to a restaurant/cafe and had some breakfast before we left Negreira. The weather was mixed. We would see overcast, drizzle, and a little sun throughout the day. We would be joined by Vn who walked with us most of the day. 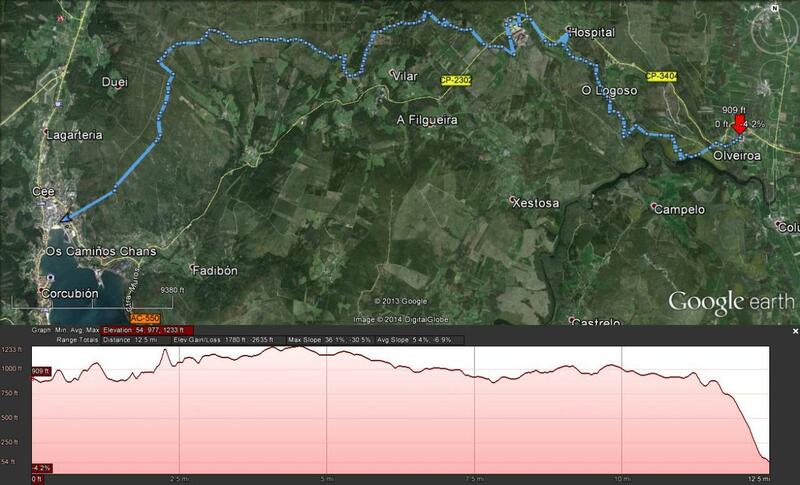 The first twelve kilometers were tough for me. I was tired and it just felt like a long hard slog though I suspect it wasn't that hard. I was just tired after walking forty days. We stopped at a couple places along the way to get food and drink. At each one we ran into pilgrims we'd met along the way and had mini reunions. Along the way we walked through forests, up and down hills, and past rain bejeweled spider webs. Along one road I was chewed out by a guy for walking on the wrong side of the road. This happened to me last Camino too. An old lady offered us apples and pears from her orchard as we passed by. I passed on the offer but Vn took one. I took a lot of these trail shots because ... I like them. At our last rest stop of the day I'd had enough. I was pooped so I bought a tube of principes and drank a coke zero. I finished the soda in the bar and I finished the tube of cookies before I even left town - yeah, some sixteen cookies in less than a mile. I inhaled those cookies. The combination of caffeine and sugar was what my body needed. Before I knew it I was a ways ahead of Gv and Vn. I even passed a few people on the uphill parts. One of pilgrim couples we passed was the Korean couple we'd met way back in Villamayor de Manjardin and again in Fonfria. The Korean woman had changed the most this Camino I think. She went from hating it to liking it. Her children and husband were proud of her and you could see how she felt about that by how she carried herself. After a very long day ... the longest so far I think ... we made it to Olveiroa. I was glad to get there as my caffeine and sugar were starting to run out of steam. We decided to stay in the municipal albergue. It was an interesting setup. Instead of one building it was a group of building an both sides of a side street off the main drag of the town. Two buildings on one side had dorms and bathrooms. Buildings on the other side had a lounge, hospitalera desk and a kitchen. It was quite nice. 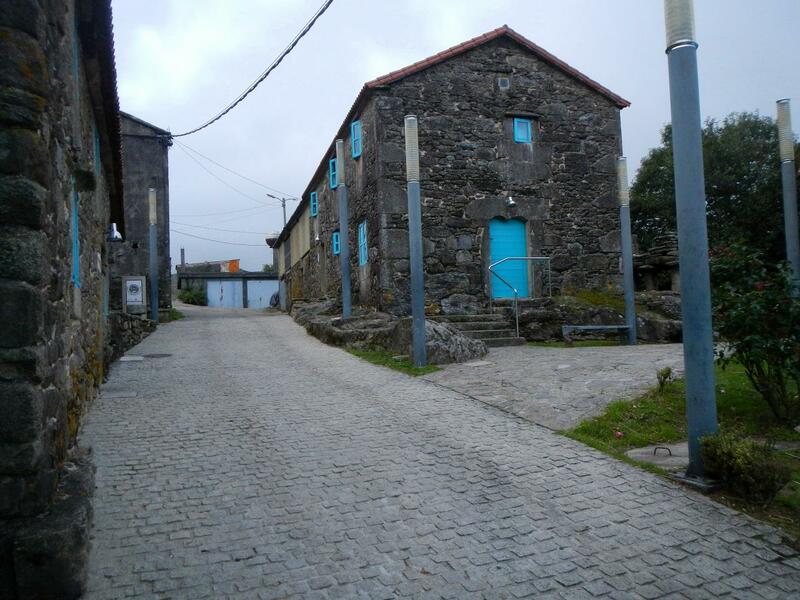 The municipal albergue in Olveiroa with the blue doors and windows. Olveiroa had changed a bit since I was here last time. The private albergue I'd stayed at had expanded and a restaurant/bar/store was next door. There were more pilgrim support in the town now. We spent some time in the bar and shopping in the store. There was a large map on the wall showing the route of the Camino and the locations of albergues, hotels, and other places to stay. I ate an ice cream bar and studied the map. We'd been thinking about stopping in Cee like I did last time but we had changed our minds a bit and were thinking about doing a really long stage and walking straight to Fisterra the next day. The map made it look not so bad. I didn't remember it being that difficult either. 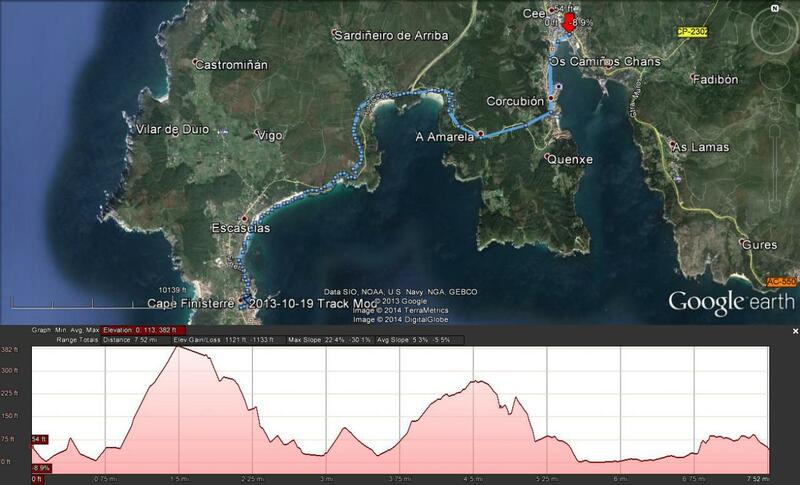 We also looked at the route from Fisterra to Muxia which we were thinking about walking. That night Gv made dinner. I remember it being a bit cold that night as the wind started to pick back up and there wasn't much sun to keep things warm. I was glad to have my base layer and half-zip to sleep in. It was hard to believe that we were almost done. Just a few more days. I fell asleep hoping the weather would cooperate for a few more days. I've said it many times before but I'm not much interested in sports - especially team sports. There are a few exceptions though. The first is the Super Bowl. I do try to watch it every year but, I have to be frank, I watch it mostly for the commercials ... and now for the tweets. The game last Sunday was not the most exciting but I did enjoy it for one sort of selfish reason and that is the so-called Super Bowl Indicator. The indicator is a strange coincidence, and that's all it is, that when an old NFC team wins the super bowl the stock market will end up that year and if an old AFC team wins it will go down for the year. While there isn't any real connection between football and the direction of the stock markets, the indicator has been correct 80% of the time which is a better record than most stock pickers. The Seahawk win means, if the coincidence holds, the market will end up for the year. Let's all hope for happy coincidences. The other sporting event I follow starts today: the Winter Olympic Games. I have always tried to watch as much of the Summer and Winter Olympics as I can which means that I will be watching a lot of TV for the next couple of weeks ... or at least I'll try. The Olympics fit in with my sports aesthetic - many of the sports are solo or small team challenges. I prefer to watch the world record being broken or the underdog pulling a little extra oomph from deep down in their gut to beat the favorite. The sad part of this Olympics is the location. I wonder, how many people will tune in, not see the athletes, but to see if there has been a terrorist attack. Let's all hope they are disappointed when the only tally read is the number of medals won by each country. This morning I woke up to the sound of wind. I looked out the window of my room and was pleased to see no rain. This lasted ... maybe fifteen or twenty minutes. It started to rain as I was putting my pack together. It wasn't as hard as the day before but it was still rain. The way to Fisterra is that way. The walk out of the city was just like I remembered it except I didn't get lost this time. The next couple days would start and stop in the same places I'd stopped last time. There were fewer stage choices between Santiago de Compostela and Fisterra though there had been a few new albergues added since I was there two years ago. We got out of the rain in a small cafe/bar where we had some breakfast. At the next town we stopped again, this time because we saw Vn in a bar eating breakfast. We said hello to him before continuing on. The rain began to lighten a bit as we walked on. 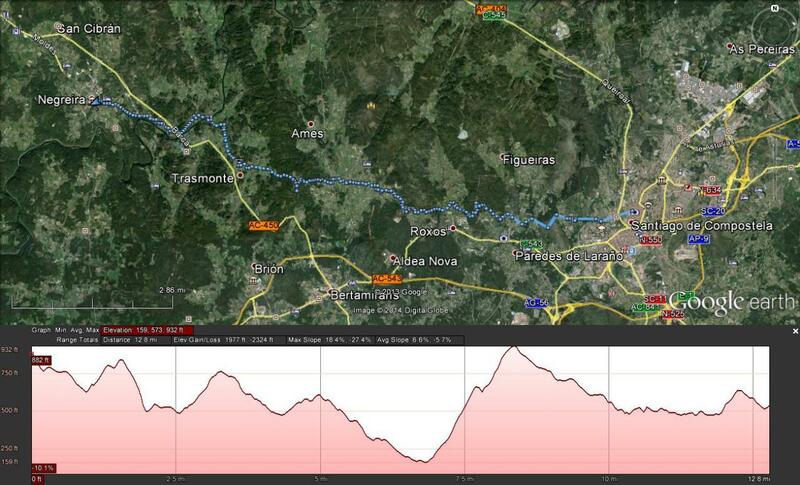 We reached a long hill after Auga Pesada that had nearly killed me last time. I remembered a lot of dirt trail climbing followed by a lot of pavement walking. My memory was not correct ... again. There was a lot more dirt trail climbing this time and much less pavement. Either way it was pretty tough. The mud was not as bad as I feared - it could have been a slippery mess. 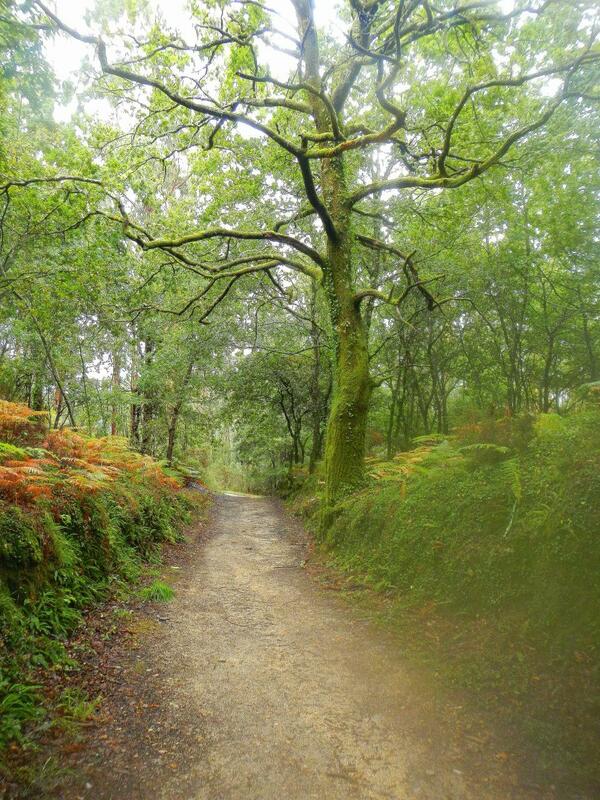 It was wet in Galicia so everything was green. Vn caught up with us at the top of the hill and we stopped for a little rest and food. He joined us as we walked the remaining seven kilometers together. 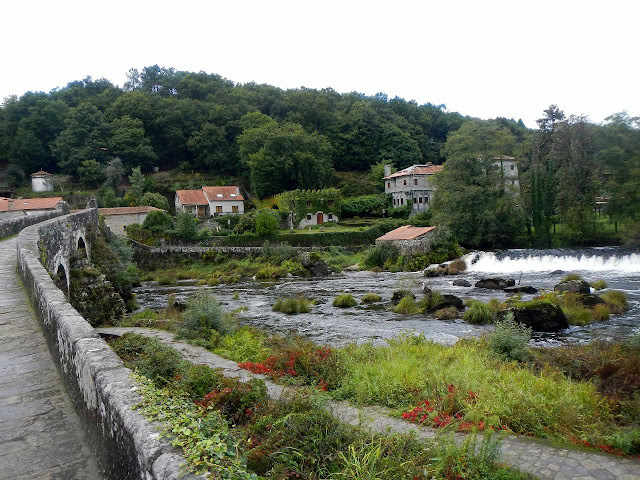 We crossed the bridge in Ponte Maceira that I'd liked so much last time and it was still a wonderful little place along the Camino. The weather started to cooperate as the rain became more intermittent. About to cross the bridge in Ponte Maceira. In Negreira we stopped at the same albergue I'd stopped at last time. The albergue had a box of newspapers for the pilgrims to dry their shoes with - it's nice when the hospitalera anticipates pilgrim's needs. I got out of my wet clothes, got into clothes that were sort of dry, and did my chores. We went out and found a place to eat some lunch and bought some groceries at a supermarket on the way back to the albergue. A pilgrim statue in Negreira. That night we followed Vn to a place he'd passed during his explorations and had dinner together. Once again it was nice to exchange stories with someone new. He was a nice man from New Hampshire, I think. He was 71 but looked at least ten years younger. The last time I walked this stage I'd felt much more content than I had been the entire Camino. I'd wondered if I would feel the same this time and I have to say that I did feel that sense of contentedness. I'm not sure what it is about the walk from Santiago de Compostela to Fisterra that makes me feel so satisfied but it does and I like it. This night, like many on the Camino, I fell asleep tired and content.